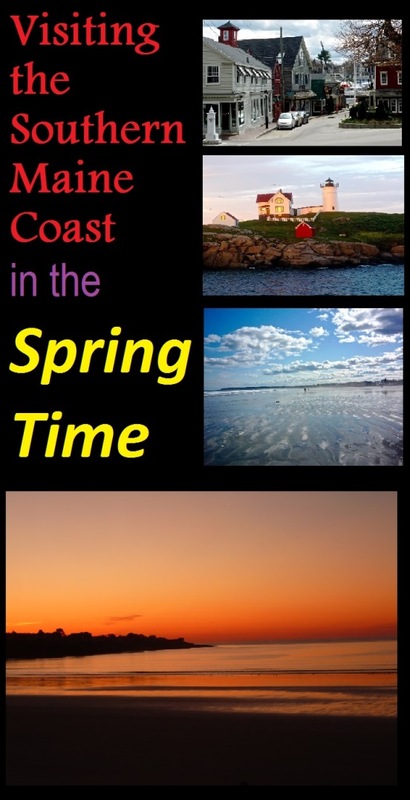 When warmer weather returns to New England, we travel directly to the southern Maine coast. Seeing the first glimpse of ocean at Long Sands Beach in York Beach creates a rebirth of the soul and senses, well-deserved after a cold, demoralizing, often-too-long New England winter. It's really one of the best ways to fall in love with coastal Maine and convenient, too -- you don't have to drive far to experience an authentic coastal Maine experience as the New Hampshire and Massachusetts border are within close proximity. Nubble Lighthouse, off in the distance, suggests a close friend that we will soon be reacquainted with, and the quarter-mile of sand and ocean water at Short Sands Beach Beach -- framed by arcades, fried food aromas, salt water taffy making, cool, salt sea air and happy, "real" people -- give us back our beloved coastal playground. We New Englanders find ways to have fun year-round, but none can quite match the feeling of being by the southern coastal Maine sea in the warmer weather, sampling a classic Downeast seafood dinner at one of the many seafood shacks and restaurants dotting the coast, and watching the sun go down behind the rocky coast. It's the kind of experience that will make you dream all winter about this lively, distinctive and incomparable region. colder weather, too. Some people (a few elitists in the mix) seem to think we're crazy traveling to York Beach when we could be in the warm environment of the Bahamas or Aruba. Not that there's anything wrong with that, but somehow putting up with a bunch of over stressed, narcissistic drunk people dancing to "Hot, Hot, Hot," leaves us "Cold, Cold, Cold." And what better way to be cold than at Maine in the winter? Our stays at York Beach have offered us a perfect romantic getaway, void of crowds of people and traffic. It's just you and the Maine coast, leaving unobstructed views and experiences so pure that you wonder if you're looking at the same beaches, towns and general lifestyle. It's the anti-cookie cutter way to vacation, in our humble New England opinion. 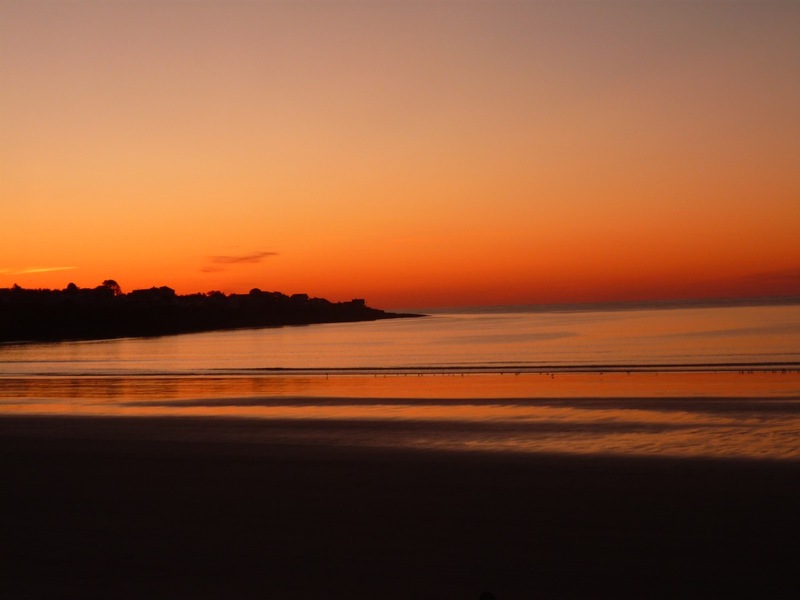 Whatever time of year, the southern Maine coastline abounds in spectacular beaches with rocky coastline, picture-perfect lighthouses, seafood shacks with lobster and New England clam chowder, quaint towns with interesting local shops and endless fun for all walks of life. Some attractions may be seasonal, but you'll always find places to visit. The south-to-north stretch starting in York and ending in Old Orchard Beach should be enough to satisfy the biggest fans of the sea. York Beach is perfect for the family with two fine beaches (Long Sands and Short Sands Beach), York's Wild Kingdom (vast and fun with a great zoo and amusement park), arcades, bowling, family motels, souvenir shops, and The Goldenrod which makes salt water taffy on the premises, has an old-fasioned soda fountain and a restaurant serving New England clam chowder and lobster rolls. Does it really get any better than that? 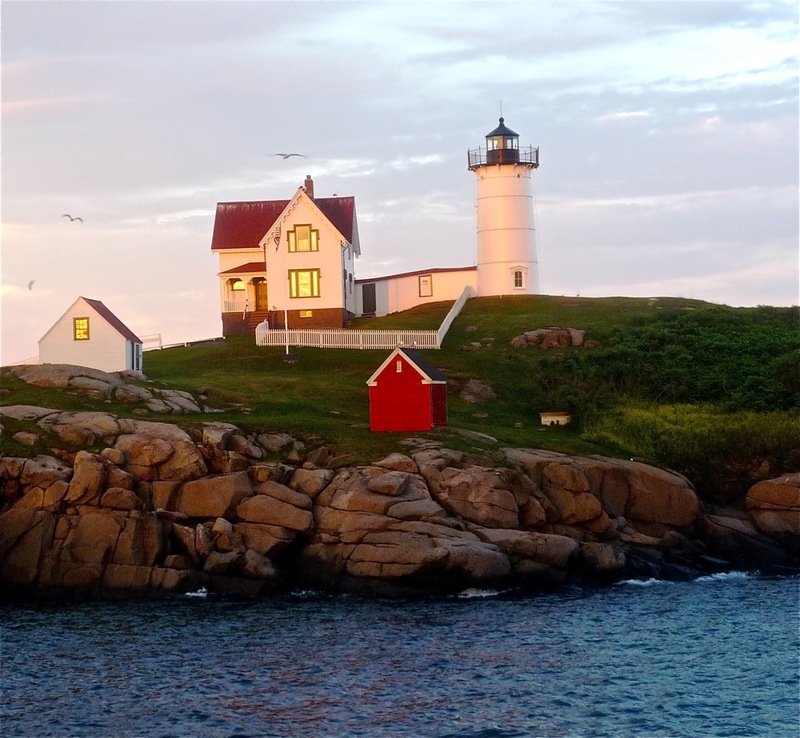 Up the road from the center is the famous Nubble Lighthouse, one of Americas most photographed lighthouses. It's a beautiful sight, a stately white lighthouse, solid as a rock and at peace with its companion, the sometimes turbulent rocky Maine coast. Fox's Lobster House (Nubble Point, York Beach, Maine. Tel. (207) 363-2643) serves lobster dinners and a partial selection of delicious Dunne's ice cream within view of the Lighthouse-- what a great indoor/outdoor summertime experience! A minute's walk will lead you to Dunne's (Nubble Rd., York Beach, Maine. Tel. 207-363-1277) where you can find a complete selection of some of the best ice cream in the region -- including wild, Maine Blueberry. Our favorite restaurant in the York area is Clay Hill Farm (220 Clay Hill Rd., Cape Neddick (York), Maine, Tel. 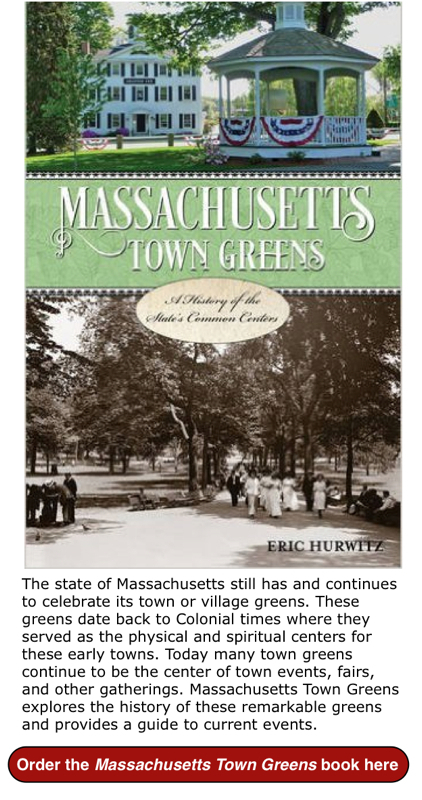 207-361-2272), one of the best restaurants in the area and possibly in New England. Clay Hill Farm's lovely gardens and warm intimate dining rooms in an old and elegant farmhouse set the tone for the freshest food we've encountered in many years of dining. The spinach salad is so alive with straight-from-the-garden taste and just the right amount of dressing. The lobster bisque jumps right at your taste bud's joy center. The roast half duck and seafood scampi are particularly amazing, so flavorful and memorable with all the right seasonings and sauces. Deserts, largely of a chocolate theme, will leave you breathless, and a great way to complete a truly romantic dining experience. On the more informal side, we love the Inn on the Blues, directly across from Short Sands Beach at York Beach. Inn on the Blues is known for its live blues entertainment, but is also serves up some of the best food in York Beach, including pesto salmon, lobster dinners and rolls, baked scallops, clam chowder accented with bacon and a good selection of sandwiches (the chicken salad is excellent). Nearby York Harbor and York Village are more laid back than York Beach, The York Village shopping district has a quaint, relaxed feel -- some prefer the quiet, understated feel with its small town feel, tree-lined side streets, spectacular oceanfront homes sporting many different types of architecture, and meandering sidewalks leading to small, independently owned shops. A small ocean beach at York Harbor is just a short walk away, as well as a fun cliff walk which requires walking over rocks, while enjoying sweeping views of the Atlantic ocean. 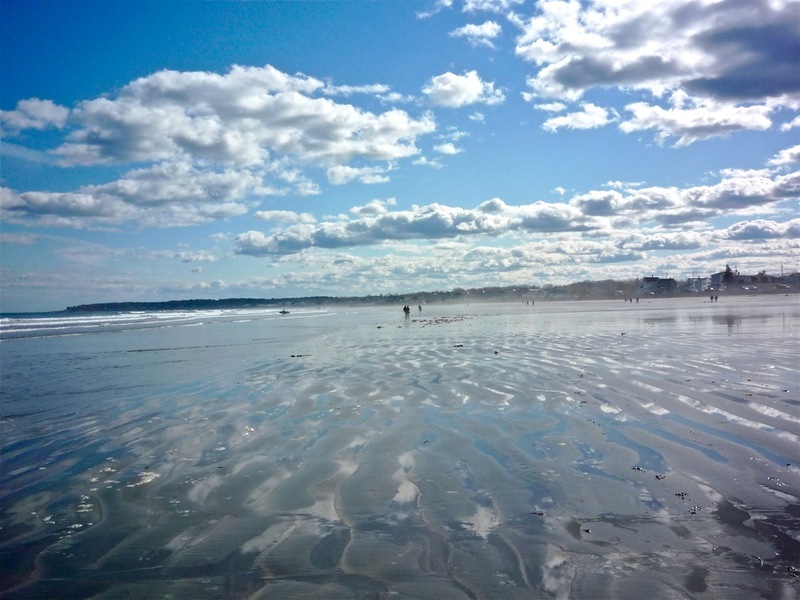 Ogunquit is more upscale, and offers a great, easy 1.5 oceanside walk along Marginal Way framed by the water on one side and brilliantly colored flowers and stunning seaside homes on the other. 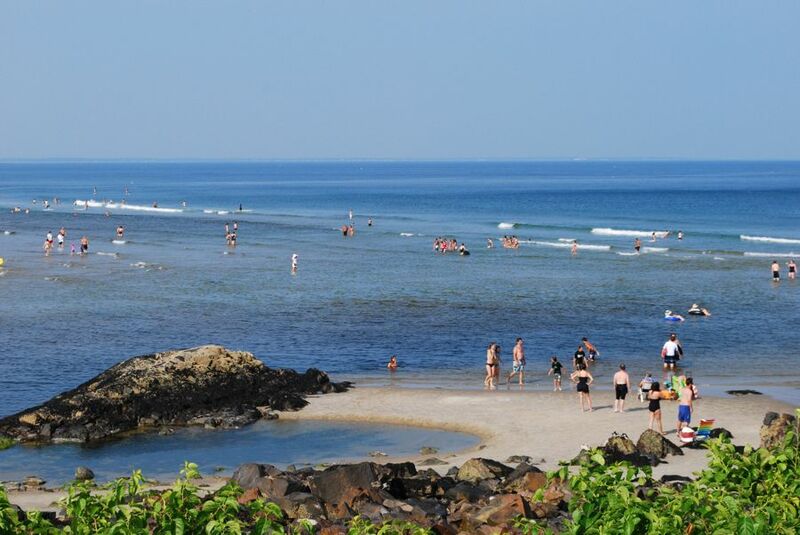 If you were given one thing to see in Ogunquit, this beautiful spot would be the top choice, in our opinion! Perkins Cove in Ogunquit is a great desintation, too, with its quaint shops and art stores that combine with seafood restaurants like Barnacle Billy's (50 Oar Weed Rd., Ogunquit, Maine, 207-646-5575) that serve up lobster and other Down East seafood cuisine with outdoor dining in the summer. The three miles of beach just off the town center is surely one of the most spectacular in New England with its wide expanses and stunning views. It's rare to find this much beach in Maine. The downtown section is also worth visiting with its nice mix of gift shops, boutiques, galleries, cafes, restaurants and inns. Ogunquit does get quite busy in the summer and parking can come at a premium. Don't let that stop, you, however, from seeing one of New England's most appealing coastal towns. Spring and fall, however, appeal to us more as the crowds are fewer and the feeling less hectic. Marginal Way, Ogunquit. Photo by Sarah Diment, owner of the Beachmere Inn, in Ogunquit. Wells is primarily a beach town with seven miles of oceanfront. It's a place where people have summer homes and love to swim in the chilly Maine waters. Wells does have a significant number of seafood restaurants, plenty of lodging by the sea and on commercial Route 1, great hiking opportunities at the Rachel Carson National Wildlife Refuge, and many stores that include antiques, collectibles, and books. There's no real central, downtown district, but that's OK as the beach is the real draw. 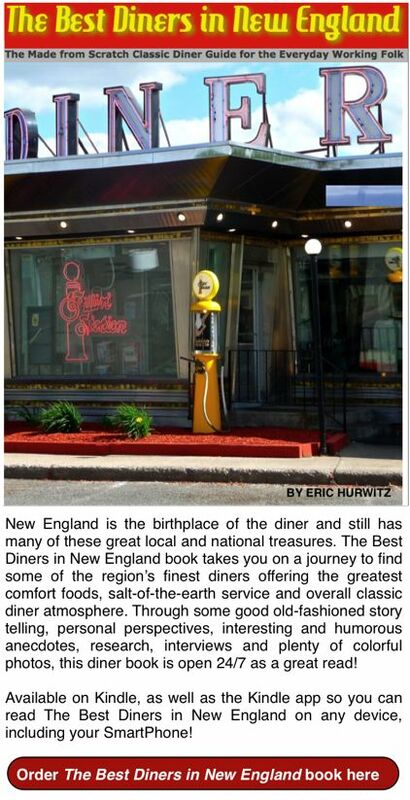 When in Wells, we like to dine at the Maine Diner (2265 Post Rd., Route One Wells, Maine. Tel. 207-646-4441). The Maine Diner offers out-of-this world seafood chowder, lobster pie, clam cake plates, fresh fried clams, yellow fin tuna steak and "Phantom Platter," an assortment of some of the Phantom Gourmet's (of New England Cable News) favorite items: a cup of seafood chowder, an eight oz. sirloin steak, two baked shrimp, five oz. of baked scallops and homemade onion rings. Don't forget to leave room for the memorable blueberry pie, traditionally a Maine favorite. There are also many other fine restaurants along Route 1 offering a wide variety of food -- everything from seafood to steaks to Asian cuisine to amazing donuts at Congdon's at 1090 Post Rd.! Kennebunkport might just be the southern Maine Coast's most appealing town. It has several beaches (the three-mile long Goose Rock's Beach is quiet and beautiful), a visually appealing downtown with water views, colorful shops and terrific restaurants (Alisson's Restaurant at 11 Dock Square), should please the whole family with its diverse menu and friendly, skilled service --the fresh seafood dishes are especially impressive). Kennebunkport is a great year-round vacation destination -- nice fall foliage in the surrounding areas, a famous tree-lighting ceremony during the holiday season, spring bringing the rebirth of gentler salt sea air breezes and, of course, the beaches and recreational opportunities in the summer. 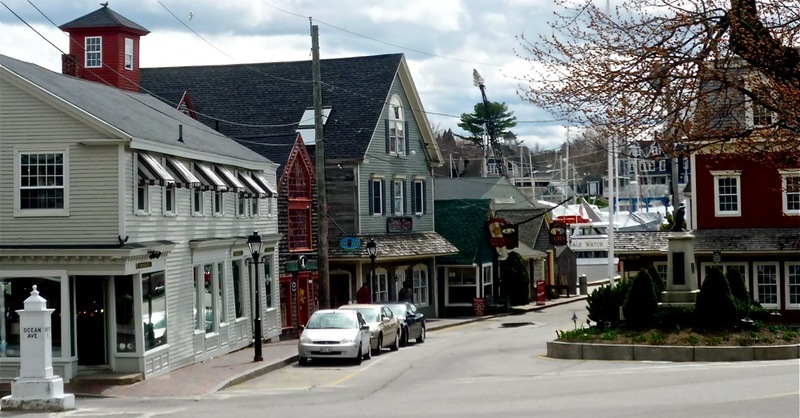 Kennebunkport is a wonderful place to walk -- the beaches, old neighborhoods boasting spectacular bed and breakfasts, the live fishing village of Cape Porpoise, and the more working class small-town feeling on Kennebunk. Tom's of Maine has its headquarters in Kennebunk. There is nothing "touristy" about the main street. Rather a stroll by the shops and restaurants, well-maintained homes, churches with tall white steeples and green areas will gently suggest perhaps checking out the local real estate. While in Kennebunk, we recommend trying the Academe at the Kennebunk Inn for dinner (at 45 Main Street, Kennebunk, Maine 04043, Tel. (207) 985-3351). The Academe offers wonderful contemporary American cuisine that's worthy of the best dining normally found in urban areas. Start the evening with some delicious homemade breads and a mixed greens salad and you're on your way to dining nirvana. For dinner there's the roasted rack of lamb with rainbow orzo, baby carrots, and rosemary oil; the cider planked seared salmon with potato rosti, apple chutney, and fried leeks; and the seared Filet mignon with Vermont cheddar and bacon gratin potato, house roasted tomatoes, wild mushrooms and bordelaise. Wonderfully displayed and incredibly flavorful, these entrees have us coming back again and again on special occasions. The warm, inviting outside glow of this 1799 Inn (with charming guest rooms upstairs) is worth the price of admission on its own! Old Orchard Beach is one of the great honky-tonk summer seaside vacation towns in New England with miniature golf, cotton candy, fried dough, French fries, cheeseburgers, carousel, arcade games, amusement rides, festivals, fairs, concerts, fireworks, boardwalk and miles of unusually sandy beach for Maine that makes this a great family summer vacation destination. While Old Orchard Beach might not be for everyone, as the crowds can get a bit much in the summer, it seems like everyone comes here! Those we know who do not like the arcades and amusements find solace at the beach -- there's no denying the beauty of the sea in Maine, and no matter how crowded it gets here, there always seems to be an open spot with enough elbow room. There's no way to go wrong with any of these southern Maine seacoast towns. Each one is unique, but yet combine seamlessly to create a wonderful travel experience. Try one out and soon you'll try them all as prime New England vacation destinations! Sunrise at Long Sands Beach, York Beach, Maine. Like this article on the southern Maine coast? Share it on Pinterest.